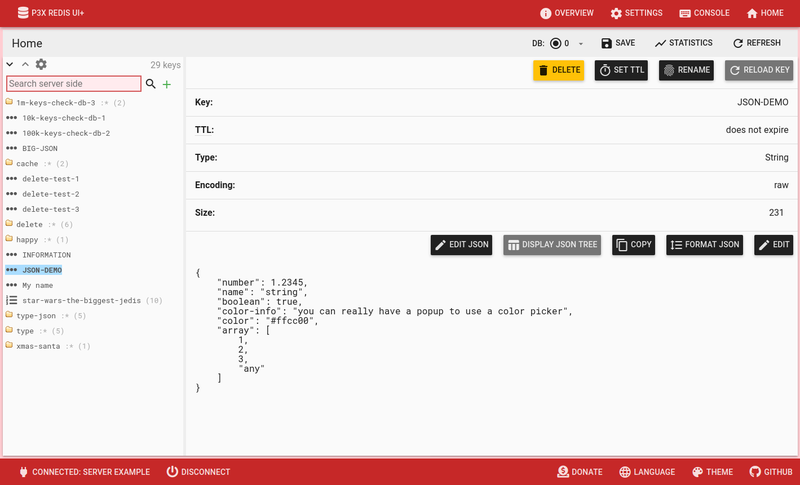 Redis UI based on redis-commander and phpRedisAdmin. 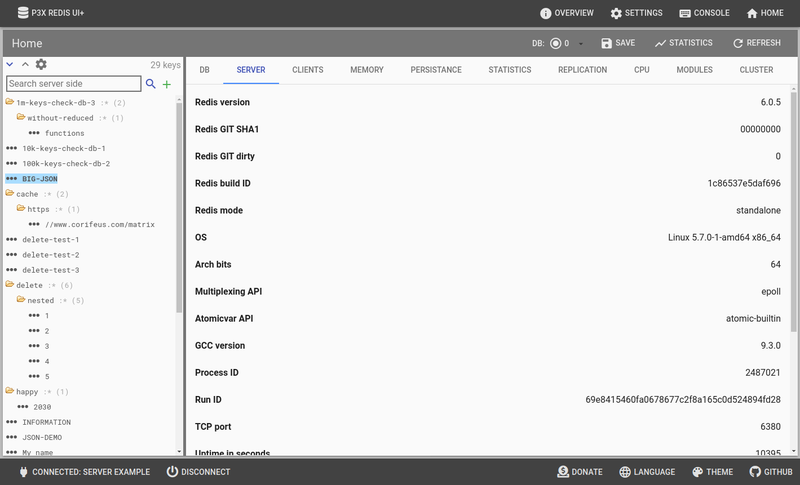 p3x-redis-ui is a new Redis GUI which can serve as a backend server or as a desktop application. Some of the features are coming below. This Redis database every day in the morning European time CET restores some data, so you may do whatever you want to do. Besides, you could experience the test app to exit for 1 second, because it could auto update itself. It auto updates itself when the code from Git changes. Third, it is a snapshot, it is possible, that the features are different from GitHub or NPM as the releases are usually monthly or as they happen. It is fast totally. Given, it is not over for 50 keys / page. You will see, that with large sets, it can take up to 15 seconds to load all the keys (dependent on the workstation and memory) and sort (if you enabled in the settings). It is usable, but it is fancy and fast for smaller key sets. Although, this app works with 1 million keys and reduced functions. For such huge key count, it is recommended to use the pure redis-cli. The sweet spot for the key count is around 10-20k including key sorting with max 100 key / page and still the app is very responsive. 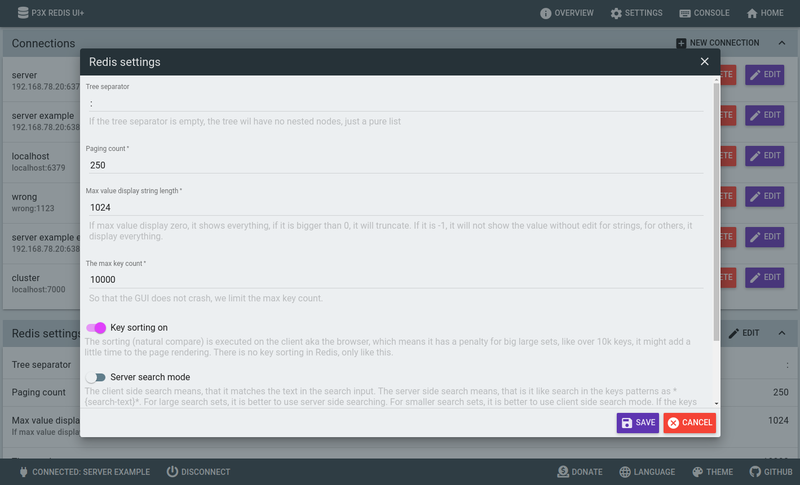 If you have a huge key set, make sure to search on the server and it will be very responsive. Above 10-20k key count as the key large set grows the GUI latency is including as well. Of course, we could set a limit and the UI would be always responsive, but there was no request of this feature. You can select the database via console or the drop down. There is a key sorting function, which has a penalty, because it sorts with natural compare, which means it is more human display, then just raw characters, but up to 100k the keys is still ok. There is a performance penalty for this application, given it uses AngularJS ng-repeat for the tree component. The best is if your application uses nested keys (something:nested:good), then the tree will be fast, but, for example, Nextcloud uses about 500 keys inline and it can take 5 seconds to generate the tree. Another solution is that instead of the : separator for your app, you can use the / separator. 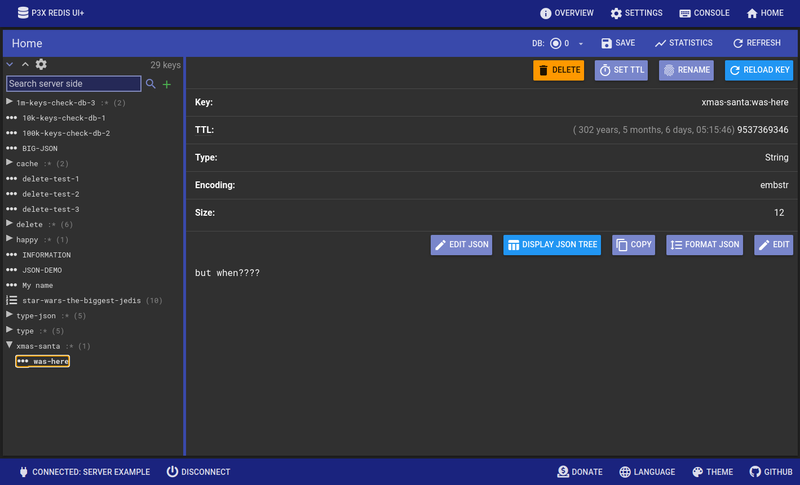 Then it will be much more responsive, see the settings tree separator. This application is not recommended with over 100k keys, because it might just crash the NodeJs server. I can understand there are use cases where you need over 100k keys, but this is not that p3x-redis-ui. For a new language: Add into redis-ui-material/src/bundle.js. 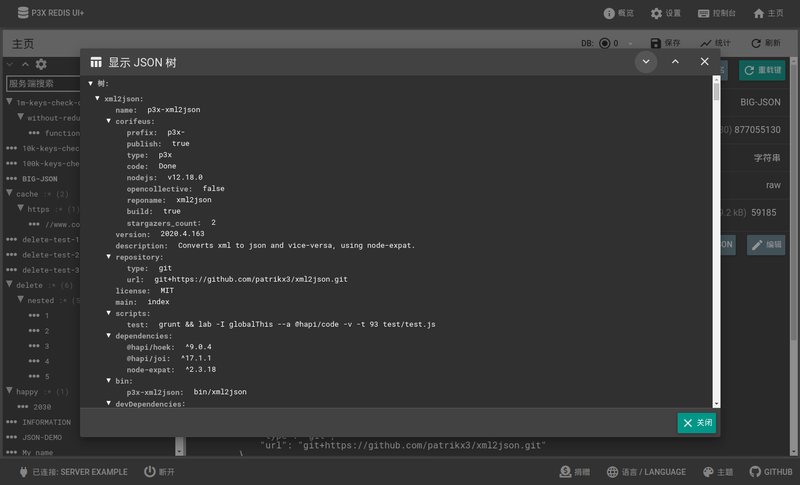 This solution is not using REST at all, but instead uses Socket.IO 藍, which is weird, but I like it, it is supposed to be more responsive, as there is no big overhead in the HTTP protocol.